PR and marketing expertise has the potential to add incredible firepower to your SEO – that much is clear. Simply put – being published online is a credibility builder. Fact. A little over 3 years ago Joanne Henson – with a history of failed diets until one day, she’d had enough and took professional advice that changed her life – trained, then started her own Health & Wellness Coaching business. However, anyone who has started a business will tell you getting your name out there is a HUGE challenge. Advertising costs can be horrendous. And it’s not just the cost. Where’s the best place to advertise? What about the competition? How can a new business truly stand out from the crowd? So what made Joanne’s business, her products, her services, stand out in the sea of virtual — or perhaps actual — sameness? She has a story. Lived the same issues thousands of others live. And no one had told it. It’s her story. It’s unique. It’s credible. 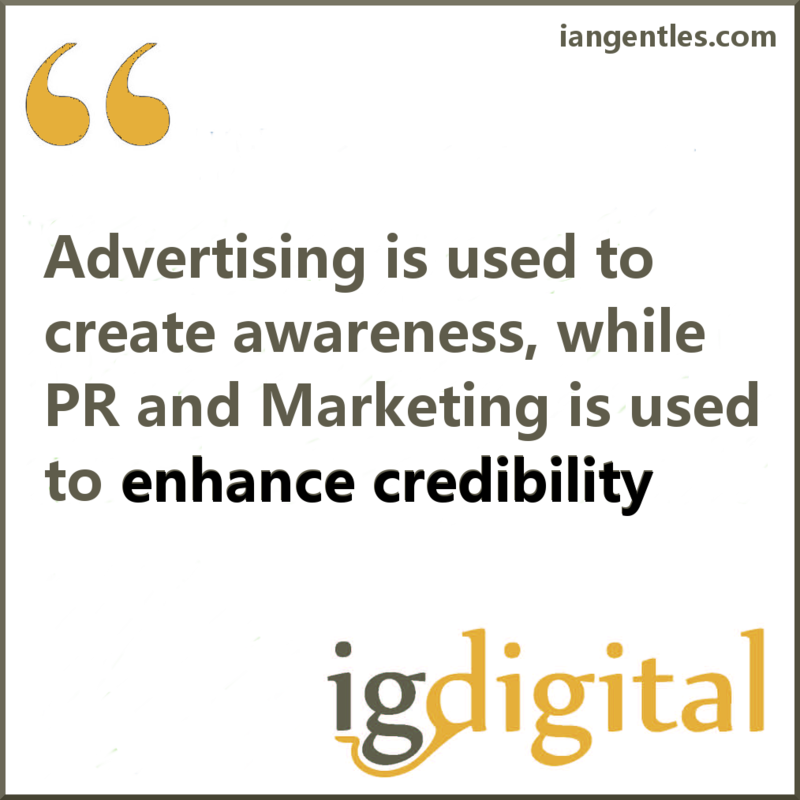 We may all know that advertising is used to create awareness, while PR and marketing is used to enhance credibility and expertise. But who actually act’s on the latter? Have YOU? In trade magazines, national and local newspapers, the radio? Pretty much all have a digital publishing presence. 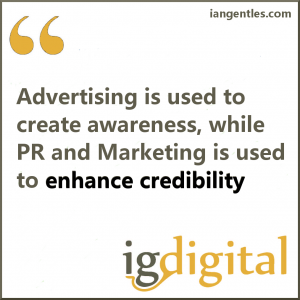 You’ll see countless businesses advertise – but are they marketing their credibility? Since I started in this business in 2007 I’ve had innumerable conversations with business owners. I’ve heard so many excuses I could write three books. …… the truth is, they just don’t know the how to make all this work in an integrated manner. They haven’t been curious enough. In fairness they’ve been brought up with advertising as the choice … and that’s what they do. Follow the herd. That’s what the competition does after all. Isn’t it? The savvy business owner recognised the convergence of marketing and PR (with SEO) a while back. And boy have they taken advantage. Now this convergence is accelerating – bridging the divide between the herd and the leaders. Will those who have yet to seize the opportunity do anything about it? We’ll see in the coming years. Many Brands Are Becoming Publishers. They are blogging, they are using social media. They now recognise there are audiences who are hungry for content that adds value to the topics, issues and trends that shape their personal and professional lives. They’ve found out people are willing to accept content from brands as long as it’s not just self-serving and overly commercial. Brands have been forced to think, act and operationalise themselves like media companies and publishers. This trend represents enormous opportunities for brands to fortify customer relationships and enhance brand reputation. We’ve all seen it. Some are brilliant – some are still learning. To differentiate, tell your unique story. Be the expert. And the opportunity to do just that, is INCREASING. Brand journalism is the fastest growing revenue earner for the traditional media (who publish digitally). Some of it is still free, most of it will become paid for. The difference that makes the difference in this new-ish world, is credibility – Joanne has it in bucket loads. You’ll be hard fetched to find any of her competitors come anywhere close. Take a look – See what she has achieved. www.joannehenson.co.uk/press. All those sharable links. WOW! What’s your plans? Feel free to let me know in the comments box below. Get out-of-the-shadows-and-into-the-spotlight and start gaining the most from an integrated PR and marketing approach. 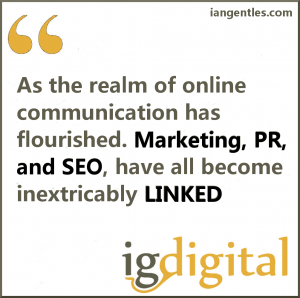 Based in Banbury, Oxfordshire, Ian Gentles can help you create more buzz and become known as a leader and expert in your industry, online and off line. 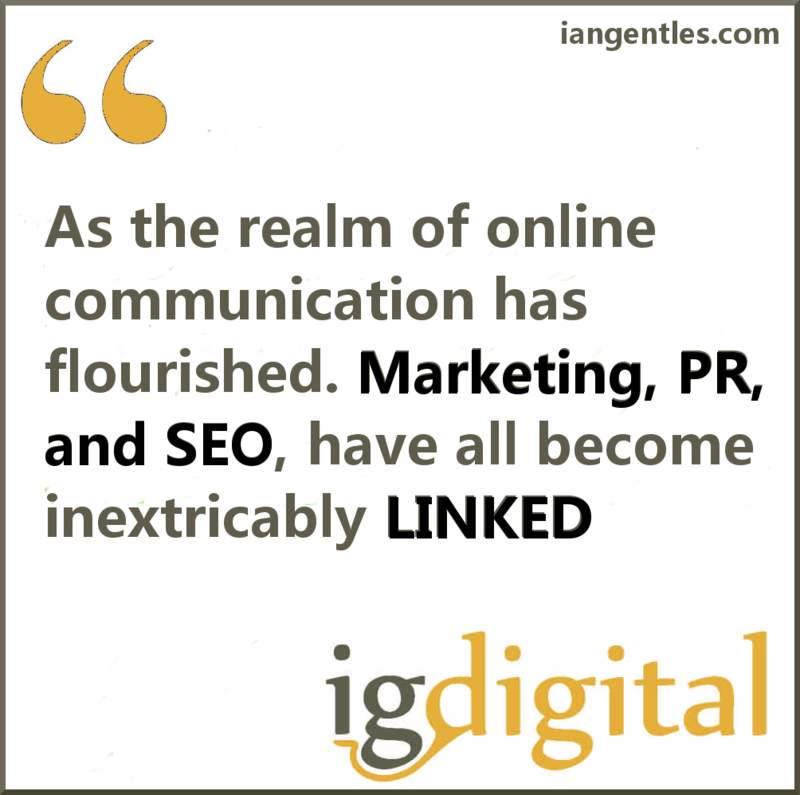 Contact Ian Gentles Digital Marketing today by email, text message or phone call 07511 217 984, and we’ll call you back.